In small mixing bowl, combine tuna and cottage cheese. Add sea salt, pepper and celery or spinach. Mix thoroughly. Spread mixture evenly on two tortillas. You can either leave it open face or fold each tortilla in half. Toast in toaster oven at 350 degrees for 5-7 minutes or until cottage cheese is melted. 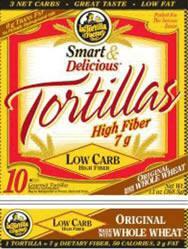 The tortillas also come in a green onion and garlic herb flavor too!